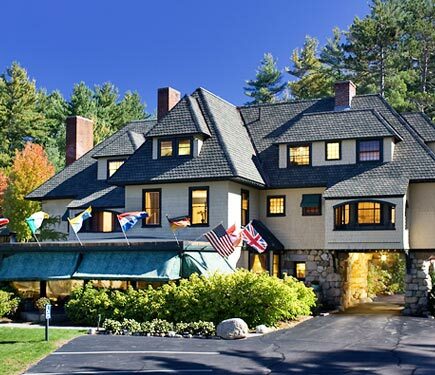 The Stonehurst Manor is a historic boutique hotel located on 33 private acres just 1 mile from North Conway Village, and 19 miles from Great Glen. Choose from 26 guest rooms and suites in the Manor, many with mountain views and fireplaces, all with dinner and full breakfast included. Relax by the wood-burning fireplace in our Library Martini Lounge and enjoy an elegant yet casual dinner in one of our four dining rooms of The Wild Rose Restaurant. Amenities include seasonal outdoor heated pool and hot tub, tennis, gardens, WIFI, mountain views, and a network of trails from our door. Pet friendly rooms and 3-bedroom vacation rentals also available.